Metropolitan Fresno is anchored by Fresno, the fifth-largest city in California and the 35th-largest in the United States. The metropolitan area is located in the Central Valley, which is one of the world's most productive agricultural regions. It has a large agricultural economy despite being increasingly urbanized. Metropolitan Fresno, unlike the other metropolitan regions of California, is still largely agricultural, contains a large rural land area and is centered in the San Joaquin Valley. The metropolitan area is located between the larger metropolitan areas of California, bordering the southernmost boundaries of the San Francisco Bay Area in the west and separated from the Greater Sacramento and Greater Los Angeles Areas to the north and south respectively by long distances of rural and farmland. Additionally, the lifestyle and culture of Metropolitan Fresno does not reflect the San Francisco or Sacramento influence as other areas have in Northern California due to distance from the state capital and bordering an unpopulated area of the outskirts of the Bay Area. 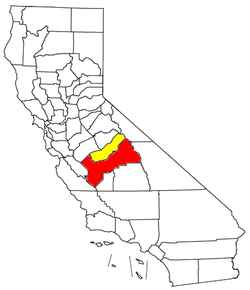 Instead, Metropolitan Fresno is more influenced by the interior valley region of California although as the area becomes more urbanized, it has become slightly more influenced by the other metropolitan areas of Northern California, particularly the Bay Area. Fresno is the largest city in the area and in the Central Valley. Along with Sacramento, it is the economic center of California's interior and is one of the fastest growing cities in the United States, with the region having a growth of over 20% since 2000. Fresno is a major transportation hub for visitors heading to Yosemite, Kings Canyon and Sequoia National Parks, which are 60 mi (97 km) and 75 mi (121 km) away from Fresno respectively with Fresno the nearest major city from the parks. The United States Military has a heavy presence in the Fresno area and numerous divisions are based in Metropolitan Fresno, including the 40th Aviation Brigade and 144th Fighter Wing. Fresno County is the largest agricultural county and has the largest concentration of agriculture than any other county in the United States. Metropolitan Fresno has a Mediterranean climate ( Köppen Csa) with some semi-arid factors due to its interior location (Köppen Bsh), with mild, moderately wet winters and hot and dry summers. December is the coolest month, with an average of 53.4 °F (11.9 °C) during the day in downtown Fresno while summer temperatures can reach 110 °F (43.3 °C) or more. Thick tule fog is present in the valley areas during the winter. Rainfall is most common between December and April while snowfall is sometimes experienced in the higher mountain elevations. Owing to its gateway location to numerous national parks as well as being in between the larger Greater Los Angeles and San Francisco Bay Area and Greater Sacramento regions, Metropolitan Fresno serves as a transportation hub in the California interior. However, unlike the larger metropolitan areas of California, Metropolitan Fresno does not have a large public transit system but is served by numerous freeways and highways. The Fresno Yosemite International Airport is the only commercial airport in the region and is a major gateway into Yosemite National Park. Additionally, there are several general aviation airports in the area, including Fresno Chandler Executive Airport, Firebaugh Airport, Sierra Sky Park Airport and Madera Municipal Airport. Metropolitan Fresno's central California location allows it to be a large rail transport center. Two Amtrak rail stations are located in the area, Santa Fe Passenger Depot and Madera which are on the San Joaquin line. Fresno Area Express and Madera County Express serve as bus transit lines connecting to downtown Fresno. Greyhound and Orange Belt Stages provide long distance bus travel to the area. Unlike the other metropolitan areas of California, Metropolitan Fresno has historically been a strong Republican stronghold and the region reflects the Coastal California and interior California divide in which coastal areas and urbanized areas of California tend to lean Democratic while interior areas tend to lean Republican. Exceptions to this are Orange County in Greater Los Angeles, which has been a Republican stronghold since the 1940s, and most of Greater Sacramento, which is a politically competitive area where the major parties are often divided in pluralities although recently there have been Democratic majorities. Metropolitan Fresno has begun to become a politically competitive region as well, as in the 2008 presidential election, the region was split with Fresno County going for Barack Obama with the majority of the votes, while John McCain carried Madera County with a comfortable margin. Locally, Democratic concentrations are found in much of Fresno and most non-agricultural suburbs while Republican concentrations are found in Madera County and most rural towns. ^ John Pike. "Fresno Air National Guard Base". Globalsecurity.org. Retrieved July 2, 2010. ^ DWR Public Affairs Office (2005). "State Water Project Today". Department of Water Resources, State of California. Archived from the original on June 10, 2007. Retrieved March 19, 2009. ^ "January 2010 Cities Ranked by Size, Numeric and Percent Change" (PDF). California Department of Finance. Archived from the original (Adobe Reader) on May 2, 2010. Retrieved May 7, 2010. ^ "California – Place: GCT-PH1. Population, Housing Units, Area, and Density: 2000". United States Census Bureau. Retrieved February 26, 2010. ^ "Supplement to the Statement of Vote: Statewide Summary by County for United States President" (PDF). California Secretary of State. April 10, 2009. Archived from the original (PDF) on June 12, 2009. Retrieved August 21, 2009.